LAUREL HIGHLANDS, PA., (July 2, 2018) – Fifty years ago, the world of children’s television programming changed forever as a humble, thoughtful and patient man from Latrobe, Pa., introduced the world to Mister Rogers Neighborhood of Make Believe. Last Friday, the Laurel Highlands Visitors Bureau, Visit PA and Visit Pittsburgh unveiled the new Fred Rogers Trail, a visitor experience showcasing the neighborhood that inspired a TV pioneer and legend. This three-day road trip starts in Rogers’ hometown of Latrobe, which was recently featured in Smithsonian Magazine’s The 20 Best Small Towns to Visit in 2018, and ends in Pittsburgh, where Rogers filmed his show. Each stop will take travelers along the pathway of Rogers’ life, from his childhood through adulthood, and includes visits to see key artifacts, including set pieces from the Neighborhood of Make-Believe. The first day of the Fred Rogers Trail highlights eight locations in the beautiful rolling hills of Pennsylvania’s Laurel Highlands. Spend an adventurous day at Idlewild & SoakZone, recognized as the “Best Children’s Park in the World” by Amusement Today. The original Mister Rogers’ Neighborhood of Make-Believe attraction operated in the park from 1989 through 2013. 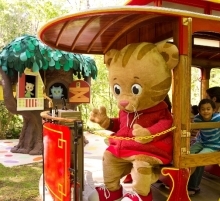 After the 2013 season, it was closed and replaced by the current Daniel Tiger’s Neighborhood ride, where Daniel and friends create smiles for a whole new generation of children. The new ride uses the same trolley, tracks, and some of the sets as the original ride, giving Mister Rogers’ Neighborhood fans a bit of nostalgia. Did you know that Daniel Tiger’s Neighborhood is the first television series inspired by the original Mister Rogers’ Neighborhood? The animated show features the son of the original program&apos;s Daniel Striped Tiger! 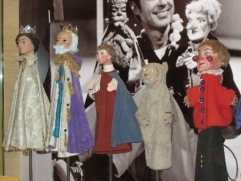 The Fred Rogers Exhibit, a public, interactive display situated on the upper level of the Fred M. Rogers Center building at Saint Vincent College. Here, trace the life, work, and influence of Fred Rogers, beginning with his hometown roots in Latrobe and continuing through the mission and vision for his pioneering legacy in children&apos;s media. The building at 1501 Ligonier St. that once housed Rogers’ high school is now privately owned, but to honor its famous graduate, the new high school, located across town close to Palmer&apos;s Latrobe Country Club, houses a large display of items from Rogers’ school years, Mister Rogers’ Neighborhood production memorabilia, and other items that show the impact that his family has and continues to have on the Latrobe community. The display is only open to the public during scheduled school activities. Take a moment to visit Fred Rogers’ final resting place and reflect on his legacy at Unity Cemetery, which sits about a mile west of Latrobe and offers panoramic views of the Chestnut Ridge of the Laurel Highlands at the foot of the Allegheny Mountains. Rogers lies in a family mausoleum along with his father, James Hillis Rogers, and his mother, Nancy McFeely Rogers, among other family members. The mausoleum bears the name “Given” and sits atop a hill near the back of the cemetery. Unity was established March 1, 1774 via a land grant from William Penn&apos;s grandson, John Penn, as a burial ground and meeting place for the Presbyterian Congregation at Unity. Unity Church was the first Presbyterian Church west of the Allegheny Mountains. Just inside the cemetery gates is Unity Chapel, which was built in 1874 and is the third Presbyterian Church build on the grounds. A plaque to the left of the chapel front provides a historical background of this special place of worship and celebration. 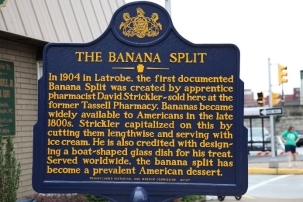 Next door to the Latrobe Art Center at 805 Ligonier Street is the birthplace of the Banana Split with a larger-than-life-size Banana Split sculpture and the Pennsylvania State Historical Marker explaining its origin. This site is a great opportunity for a photograph, so get your camera ready! We recommend Valley Dairy Restaurant nearby to get your very own boat filled with one scoop each of vanilla, chocolate, and strawberry ice cream. The Latrobe community celebrates this sweet treat every August during the Great American Banana Split Festival! 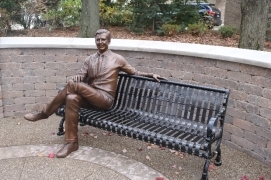 Media Toolkit: Check out the Laurel Highlands stops along the Fred Rogers Trail here - https://www.laurelhighlands.org/blog/post/the-fred-rogers-trail/. To request high-resolution images, please contact Anna Weltz at aweltz@laurelhighlands.org. A magnificent mountainous region, the Laurel Highlands spans 3,000 square miles in southwestern Pennsylvania. Located an hour east of Pittsburgh, the beautiful four-season destination offers some of the most spectacular natural scenery, outstanding outdoor recreation, historic sites and attractions, family activities and world-class resorts. Notable destinations within the region include four architectural masterpieces by Frank Lloyd Wright – Fallingwater®, Kentuck Knob, Duncan House and Lindholm House – Nemacolin Woodlands Resort, Seven Springs Mountain Resort, Flight 93 National Memorial, Idlewild and Soak Zone, whitewater rafting at Ohiopyle State Park and more.